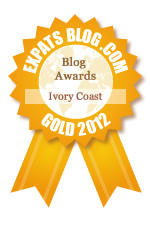 ExpatsBlog.com Expat Blog Awards 2012: Ivory Coast Gold Award! This blog won the Gold Award for best expat blog in Ivory Coast! How many families actually manage to get the audience interested and involved? There have been bloggers, mum-bloggers but Global Grazers has set an international trailblaze from Cote d'Ivoire no less! A family all blogging on their favourite subjects. Wonderful initiative, great read & worth a gold prize! Thanks for sharing your expat experience through your amazing blog.It makes me want to know more about Cote d'Ivoire, its landscapes, its culture and beautiful people. Keep up the great work! This is one of my favorite blogs! All posts are written very beautifully and their stories extremely interesting. A truly enjoyable read I recommend everyone to check out! Amazing blog! I am absolutely in love with this blog and check it on a daily basis. A family blog that works! this is a wonderful blog - full of passion. Your Name Do you think this blog has what it takes to be listed at the top of Expats in Ivory Coast Blogs?